What appears from the street to be one building is actually three separate buildings for three separate owners. Charles W. Rogers established a confectionery shop on the west side of Government Street in 1885. In 1891 his original shop was torn down along with other buildings on the block to make way for new B.C. Land and Investment Agency Building. 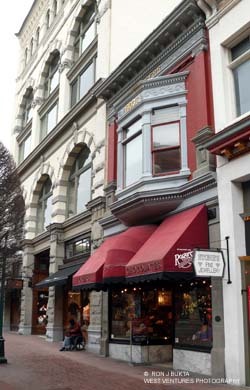 Rogers resumed his business in a new shop located in this building; he remained at this location until 1917. The Rogers building formed the left site of the symmetrical three part composition. The two outside blocks featured metal clad bay windows projecting from the second storey; the centre structure rose three feet higher than the adjoining blocks in order to accommodate a higher first-story ceiling; all three were unified by a common metal cornice and freize design. All three buildings contained retail facilities on the first floor, with living accommodation above. Rogers rented his building to Brown and Cooper, fish and fruit merchants. By 1905 this firm had moved to 27 Government and been replaced by W.B. Shakespeare, a jeweller. In 1909 a second jeweller, W.B. Wilkerson, was listed as occupant; he remained until 1916. In the following year, C.W. 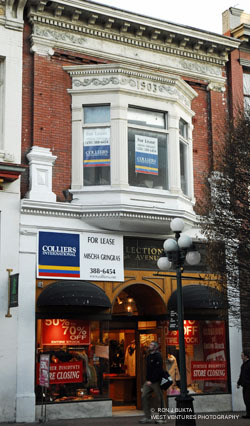 Rogers moved his own business into the building from his former premises across the street. The building has received commemoration by the Historic Sites and Monuments Board. The centre section was built for F. Moore of the Victoria Chemical Company, and the third, for Brown and Cooper, fishmonger and fruiterer. By 1907, the occupants of the three buildings were: 913 – W. B. Shakespeare jeweller; 911 – W. B. Hinton electrician and 909 – Brown and Cooper with H. E. Newton living above. 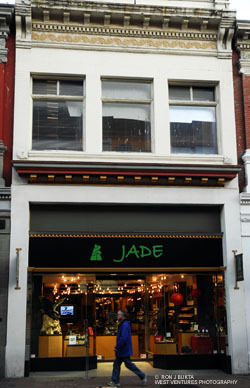 Today, Rogers still occupies 913, while 911 is home to Jade – jeweller and 909 to Collections by 5th Avenue – fine clothing.